This Article contains the basic lease provisions between Landlord and Tenant. A. Building: ______________, Washington (the “Property” as further described in Article 32 and Exhibit A-1). B. Premises: Suite _______ in the Building as outlined on Exhibit A-2. C. Commencement Date: ___________ subject to Article 3. D. Expiration Date: ___________ subject to Article 3. E. Rentable Area: The rentable area of the Premises shall be deemed _________ square feet, and the rentable area of the Property shall be deemed ________ square feet, for purposes of this Lease, subject to Article 32. F. Tenant’s Share: __________ percent (____%), subject to Articles 4 and 32. $_________ per month thereafter through the Expiration Date, as further described in Article 4. H. Additional Rent: Tenant shall pay Tenant’s Share of Taxes and Expenses in excess of the amounts respectively for the years _____ (“Base Tax Year”) and _____ (“Base Expense Year”), as further described in Article 4. I. Permitted Use: Executive and administrative offices, subject to Article 7. J. Security Deposit: $_________, which shall be subject to Article 16. K. Broker (if any): __________ who shall be paid by Landlord, subject to Article 26. M. Riders/Exhibits: In addition to Exhibit A-1 (Property), Exhibit A-2 (Premises) and Exhibit B Rules and Regulations, this Lease includes: Exhibit C Work Agreement and Exhibit D Parking Agreement. Rent shall be paid to “__________” at ___________________ or such other parties and addresses as to which Landlord shall provide advance notice. The foregoing provisions shall be interpreted and applied in accordance with the other provisions of this Lease. The terms of this Article, and the terms defined in Article 32 and other Articles, shall have the meanings specified therefor when used as capitalized terms in other provisions of this Lease or related documentation (except as expressly provided to the contrary therein). Landlord hereby leases to Tenant and Tenant hereby leases from Landlord the Premises subject to the provisions herein contained. Tenant has inspected the Premises (and portions of the Property, Systems and Equipment providing access to or serving the Premises) or has had an opportunity to do so, and agrees to accept the same “as is” without any agreements, representations, understandings or obligations on the part of Landlord to perform any alterations, repairs, installations or improvements unless expressly provided under this Lease. A. Term and Confirmation. The term (“Term”) of this Lease shall commence on the Commencement Date and end on the Expiration Date, unless sooner terminated as provided herein, subject to adjustment as provided below and the other provisions hereof. If the Commencement Date is advanced or postponed as provided below, the Expiration Date set forth in Article 1 shall not be changed, unless Landlord so elects by notice to Tenant. Tenant shall execute a confirmation of the Commencement Date and other matters in such form as Landlord may reasonably request within ten (10) days after requested; any failure to respond within such time shall be deemed an acceptance of the matters as set forth in Landlord’s confirmation. If Tenant disagrees with Landlord’s adjustment of the Commencement Date, Tenant shall pay Rent and perform all other obligations commencing on the date determined by Landlord, subject to refund or credit when the matter is resolved. B. Early Commencement. The Commencement Date, Rent and Tenant’s other obligations shall be advanced to such earlier date as: (i) Landlord substantially completes any improvements to the Premises required under this Lease to an extent that Tenant is able to occupy the Premises, and Landlord delivers possession thereof, or (ii) Tenant, with Landlord’s written permission, otherwise commences occupying the Premises. If either such events occurs with respect to a portion of the Premises, the Commencement Date, Rent and Tenant’s other obligations shall be so advanced with respect to such portion (and fairly prorated based on the rentable square footage involved). During any period that Tenant shall be permitted to enter the Premises prior to the Commencement Date other than to occupy the same (e.g., to perform alterations or improvements), Tenant shall comply with all terms and provisions of this Lease, except those provisions requiring the payment of Base Rent. Landlord shall permit early entry, so long as the Premises are legally available, Landlord has completed any work required under this Lease, and Tenant is in compliance with the other provisions of this Lease, including the insurance requirements under Article 10. C. Commencement Delays. The Commencement Date, Rent and Tenant’s other obligations shall be postponed to the extent Tenant is unable to occupy the Premises because Landlord fails: (i) to substantially complete any improvements to the Premises required to be performed by Landlord under this Lease, or (ii) to deliver possession of the Premises for any other reason, including holding over by prior occupants, except to the extent that Tenant, its contractors, agents or employees in any way contribute to either such failures. If either such event occurs with respect to a portion of the Premises, the Commencement Date, Rent and Tenant’s other obligations shall be so postponed with respect to such portion (and fairly prorated based on the rentable square footage involved). If Landlord so fails for a ninety (90) day initial grace period, Tenant shall have the right to terminate this Lease by notice within ten (10) days thereafter, subject to Landlord’s right to cure as provided in Article 21. Any such delay in the Commencement Date shall not subject Landlord to liability for loss or damage resulting therefrom, and Tenant’s sole recourse with respect thereto shall be the postponement of Rent and other obligations and right to terminate this Lease described herein. A. Base Rent. Tenant shall pay Landlord the monthly Base Rent set forth in Article 1 in advance on or before the first day of each calendar month during the Term; provided, Tenant shall pay Base Rent for the first full calendar month for which Base Rent shall be due (and any initial partial month) when Tenant executes this Lease. B. Taxes and Expenses. Tenant shall pay Landlord Tenant’s Share of Taxes and Expenses in excess of the amounts of Taxes and Expenses respectively for the Base Tax Year and Base Expense Year in the manner described below. The foregoing capitalized terms shall have the meanings specified therefor in Articles 1 and 32. (i) Landlord may reasonably estimate in advance the amounts Tenant shall owe for Taxes and Expenses for any full or partial calendar year of the Term. In such event, Tenant shall pay such estimated amounts, on a monthly basis, on or before the first day of each calendar month, together with Tenant’s payment of Base Rent. Such estimate may be reasonably adjusted from time to time by Landlord, including adjustments to reflect the final Tax bills each year. (ii) Within 120 days after the end of each calendar year, or as soon thereafter as practicable, Landlord shall provide a statement (the “Statement”) to Tenant showing: (a) the amount of actual Taxes and Expenses for such calendar year, with a listing of amounts for major categories of Expenses, (b) any amount paid by Tenant towards Taxes and Expenses during such calendar year on an estimated basis, and (c) any revised estimate of Tenant’s obligations for Taxes and Expenses for the current calendar year. (iii) If the Statement shows that Tenant’s estimated payments were less than Tenant’s actual obligations for Taxes and Expenses for such year, Tenant shall pay the difference within ten (10) days after Landlord sends the Statement. (iv) If the Statement shows an increase in Tenant’s estimated payments for the current calendar year, Tenant shall: (a) pay the difference between the new and former estimates for the period from January 1 of the current calendar year through the month in which the Statement is sent within ten (10) days after Landlord sends the Statement, and (b) thereafter pay the new estimated amount until Landlord further revises such estimated amount. (v) If the Statement shows that Tenant’s estimated payments exceeded Tenant’s actual obligations for Taxes and Expenses, Landlord shall credit the difference against payment of Rent next due. If the Term shall have expired and no further Rent shall be due, Landlord shall provide a refund of such difference at the time Landlord sends the Statement. (vi) Landlord reserves the right to reasonably change, from time to time, the manner or timing of Tenant’s payments for Taxes and Expenses. In lieu of providing one Statement covering all such items, Landlord may provide separate statements, at the same or different times, including separate statements for Taxes after bills are received. (vii) Tenant acknowledges that Landlord’s ability to budget and incur expenses depends on the finality of such Statement, and accordingly agrees that time is of the essence of this Paragraph. If Tenant takes exception to any matter contained in the Statement as provided herein, Tenant shall notify Landlord of such exception in writing not later than thirty (30) days following Tenant’s receipt of such statement, and Landlord shall refer the matter to an independent certified public accountant, whose certification as to the proper amount shall be final and conclusive as between Landlord and Tenant. Tenant shall promptly pay the cost of such certification unless such certification determines that Tenant was overbilled by more than 5%. Pending resolution of any such exceptions in the foregoing manner, Tenant shall continue paying Tenant’s Share of Taxes and Expenses in the amounts determined by Landlord, subject to adjustment after any such exceptions are so resolved. If such certification determines that Tenant was overbilled, then Tenant shall receive a credit for the amount of such overbilling against payments of Rent next due. D. Fiscal Years and Tax Years. If Landlord now or hereafter uses a non-calendar fiscal year: (i) all references to calendar years herein shall refer to such fiscal years, (ii) all references to January 1 and December 31 herein shall refer, respectively, to the first and last days of such fiscal years as the context requires, and (iii) if Landlord changes fiscal years, Landlord shall make appropriate prorations such that Tenant’s obligations hereunder are not materially adversely affected thereby. Subject to Paragraph E below, Landlord shall include in Taxes each year hereunder: (a) in general, the amounts levied, assessed or imposed for such year, whether paid or payable in another year, (b) for personal property taxes, the amounts paid during such year, and (c) for Taxes paid in installments over more than one year, the amounts paid each year, and any interest thereon. If any taxing authority uses a fiscal year other than a calendar year, Landlord may elect from time to time, consistent with sound accounting and management practices, to require payments by Tenant based on: (x) amounts paid or payable during each calendar year without regard to such fiscal years, (y) amounts paid or payable during each calendar year, averaging the bills for each calendar year based on the number of days or months of such calendar year included in each fiscal tax year, or (z) amounts paid or payable for or during each fiscal tax year. E. Tax Refunds, Protest Costs, and Expense Adjustments For Prior Years. Landlord shall each year: (i) credit against Taxes any refunds received during such year, (ii) include in Taxes any additional amount paid during such year, involving an adjustment to Taxes for a prior year, due to error by the taxing authority, supplemental assessment, or other reason, (iii) include, in either Taxes or Expenses, any fees for attorneys, consultants and experts, and other costs paid during such year in attempting to protest, appeal or otherwise seek to reduce or minimize Taxes, whether or not successful, (iv) credit against Expenses the cost of any item previously included in Expenses, to the extent that Landlord receives reimbursement from insurance proceeds or a third party during such year (excluding tenant payments for Taxes and Expenses), and (v) make any other appropriate changes to reflect adjustments to Taxes or Expenses for prior years, regardless of whether Landlord uses an accrual system of accounting for other purposes. F. Grossing Up. If the Property is not at least 95% occupied during all or a portion of any calendar year, Landlord may, in accordance with sound accounting and management practices, determine the amount of variable Taxes and Expenses (i.e. those items which vary according to occupancy levels) that would have been paid had the Property been at least 95% occupied, and the amount so determined shall be deemed to have been the amount of Taxes and Expenses for such year. If Landlord is not furnishing any particular utility or service (the cost of which, if performed by Landlord, would be included in Expenses) to a tenant during any period, Landlord may for such period: (i) adjust Expenses to reflect the additional amount that would reasonably have been incurred during such period had Landlord furnished such utility or service to such tenant, or (ii) exclude the rentable area of such tenant from the rentable area of the Property in computing Tenant’s Share of the component of Expenses for such utility or service. G. Tenant’s Share Adjustments. If the Property or any development of which it is a part, shall contain non-office uses during any period, Landlord shall have the right to determine, in accordance with sound accounting and management practices, Tenant’s Share of Taxes and Expenses for only the office portion of the Property or of such development; in such event, Tenant’s Share shall be based on the ratio of the rentable area of the Premises to the rentable area of such office portion for such period. Tenant’s Share shall be subject to such other adjustments for such periods as may be applicable pursuant to Paragraph E, above, and pursuant to the definition of Tenant’s Share in Article 32. H. Prorations. If the Term commences on a day other than the first day of a calendar month or ends on a day other than the last day of a calendar month, the Base Rent and any other amounts payable on a monthly basis shall be prorated on a per diem basis for such partial calendar months. If the Base Rent is scheduled to increase under Article 1 other than on the first day of a calendar month, the amount for such month shall be prorated on a per diem basis to reflect the number of days of such month at the then current and increased rates, respectively. If the Term commences other than on January 1, or ends other than on December 31, Tenant’s obligations to pay amounts towards Taxes and Expenses for such first or final calendar years shall be prorated on a per diem basis to reflect the portion of such years included in the Term. I. Payments After Lease Term Ends. Tenant’s obligations to pay Taxes and Expenses (or any other amounts) accruing during, or relating to, the period prior to expiration or earlier termination of this Lease, shall survive such expiration or termination. Landlord may reasonably estimate all or any of such obligations within a reasonable time before, or anytime after, such expiration or termination. Tenant shall pay the full amount of such estimate, and any additional amount due after the actual amounts are determined, in each case within ten (10) days after Landlord sends a statement therefor. If the actual amount is less than the amount Tenant pays as an estimate, Landlord shall refund the difference within thirty (30) days after such determination is made. 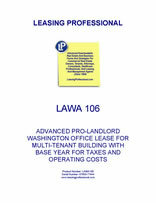 J. Landlord’s Accounting Practices and Records. Landlord shall maintain records respecting Taxes and Expenses and determine the same in accordance with sound accounting and management practices. Subject to the other provisions of this Article, Landlord may from time to time use a full accrual system of accounting, or a modified cash basis of accounting with appropriate accrual adjustments to ensure that each year includes substantially the same major recurring items. Unless Tenant takes exception by notice to Landlord within thirty (30) days after Landlord provides any Statement to Tenant, such Statement shall be considered final and binding on Tenant (except as to additional Expenses or Taxes not then known or omitted by error). If Tenant takes exception by notice within such time, Landlord may seek certification from Landlord’s independent certified public accountant as to the proper amount of Taxes and Expenses. In such case: (i) such certification shall be considered final and binding on both parties (except as to additional Expenses or Taxes not then known or omitted by error), and (ii) Tenant shall pay Landlord for the cost of such certification, unless it shows that Taxes and Expenses were overstated by at least five (5) percent. Pending resolution of any such exceptions, Tenant shall pay Tenant’s Share of Taxes and Expenses in the amounts shown on such Statement, subject to credit, refund or additional payment after any such exceptions are resolved. K. Base Year Adjustments. If Taxes for the Base Tax Year are reduced as the result of protest, or by means of agreement, or as the result of legal proceedings or otherwise, Landlord shall adjust Tenant’s obligations for Taxes in all years following the Base Tax Year, and Tenant shall pay Landlord within 30 days after notice any additional amount required by such adjustment for any such years or portions thereof that have theretofore occurred. Landlord shall exclude from Base Year Expenses any non-recurring items, including capital expenditures otherwise permitted under Article 32 of the Lease (and shall only include the amortization of such expenditures in subsequent year Expenses to the extent permitted under Article 32, including any remaining amortization of permitted capital expenditures made prior to or after the Commencement Date). If Landlord eliminates from any subsequent year Expenses a recurring category of expenses previously included in Base Year Expenses, Landlord shall subtract such category from Base Year Expenses commencing with such subsequent year. L. General Payment Matters. Base Rent, Taxes, Expenses and any other amounts which Tenant is or becomes obligated to pay Landlord under this Lease or other agreement entered in connection herewith, are sometimes herein referred to collectively as “Rent,” and all remedies applicable to the non-payment of rent shall be applicable thereto. Rent shall be paid in good funds and legal tender of the United States of America. Tenant shall pay Rent without any deduction, recoupment, set-off or counterclaim, and without relief from any valuation or appraisement laws. Rent obligations hereunder are independent covenants. Provided that Landlord shall provide such statement within seven (7) months of the expiration of this Lease, no delay by Landlord in providing the Statement (or separate statements) shall be deemed a default by Landlord or a waiver of Landlord’s right to require payment of Tenant’s obligations for actual or estimated Taxes or Expenses. In no event shall a decrease in Taxes or Expenses ever decrease the monthly Base Rent or give rise to a credit in favor of Tenant. Landlord may apply payments received from Tenant to any obligations of Tenant then accrued, without regard to such obligations as may be designated by Tenant.